Songs from a Journey with a Parrot invites children on an authentic musical journey exploring the ties that bind the two countries. Crossing the Atlantic Ocean, from Porto to Rio, this collection of traditional songs and rhymes include lyrics about everyday life, work and play, courtship and love. Songs about the neighbor’s rooster, white doves and golden parrots, a sailor from Bahia, water sellers in the square, or a circle dance called the ciranda, reflect a rich childhood musical tradition handed down for centuries in these Portuguese-speaking countries. 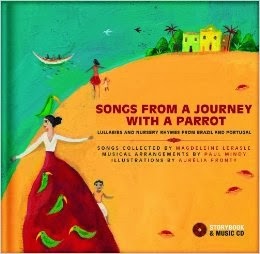 Originally published in France and newly available with English translations, the colorfully illustrated picture book includes lyrics in Portuguese followed by notes in English about the origin and cultural context for each song. The accompanying CD features 30 traditional songs that blend a range of musical styles: samba, modinha, fandago and bossa nova, performed by native speakers from both countries. The production features several indigenous acoustic instruments and captures the meeting of rich and diverse styles from Brazil and Portugal. Other international lullaby titles include Songs from the Baobab (West Africa), Songs from the Garden of Eden (Jewish), Songs in the Shade of the Flamboyant Tree (French Creole)and Songs in the Shade of the Olive Tree (North African). We are studying a variety of countries this school year and I was so excited to get this book for review. It will fit in perfectly as we study Brazil. The 30 songs are traditional to Brazil and Portugal. The book and Cd are geared toward ages 2-8, the songs are primarily for the younger set. The book is rich in illustrations and absolutely beautiful! I so enjoy the combination of visual book, and audio CD for a true experience with the senses! This book is one you will want to hang on to for years to come. AUTHOR Magdeleine Lerasle is an early childhood educator and researcher specializing in teaching language to children, and an author of Songs in the Shade of the Olive Tree. ILLUSTRATOR Aurélia Fronty is an illustrator and textile designer whose work includes I Have the Right to Be a Child, One City Two Brothers, and Up and Down the Andes. PRODUCER Paul Mindy is an award-winning musician who received the Georges Brassens Prize to honor his work in Brazilian music. He is an arranger, composer, singer, and percussionist. Interesting. A great way to bring the culture to kids in a fun way. Songs and stories make learning fun and exciting.